Last week, I had the chance to visit Great American Ball Park for the first time since 2013. (I realize that’s nothing unusual for most of you, but for yours truly, the commute from Los Angeles is a real pain.) Prior to that year, when I caught two of the Reds’ season-ending losses en route to their Wild Card defeat in Pittsburgh, I’d seen just one game at GABP Ã¢â‚¬â€œ a 2004 midsummer drubbing by the Cardinals that, according to Baseball Reference, featured multiple Cincinnati players of whom I have absolutely no memory (Tim Hummel, anyone?). As much as I enjoy watching the Reds play in person, it’s hard to justify spending hundreds of dollars to fly across the country just for baseball, so most years, I see the team five or six times Ã¢â‚¬â€œ first during my annual pilgrimage to Spring Training, and then again when they visit the Dodgers. Occasionally, I’ll take a day trip to catch them in San Diego as well, but unless it’s one of the rare years where they also hit Anaheim, that’s typically the extent to which I see the Reds in the flesh each season. Being a fan of a team you get to see so sparingly is a bit like being in a long-distance relationship. You enjoy the time you spend together while cursing the fact that it passes so quickly; you regret having to say goodbye; and you eagerly anticipate your next meeting, anxiously counting the days until the magical moment finally arrives. From the second I left Goodyear this spring, I began counting the days until I’d get to visit Cincinnati on a trip that bookended my high school reunion in Nashville. 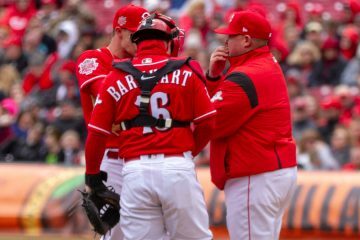 The plan was to fly into Northern Kentucky last Wednesday to see Amir Garrett pitch his home debut, head south the following morning, visit with some family and old friends for a few days, and then drive back up to Cincy to catch a Sunday matinee against the Cubs. We arrived at GABP about 30 minutes before the first pitch on Wednesday night. As was the case during my 2013 trip, I was immediately struck by the simple fact that I wouldn’t be the only person wearing red that night, as is often the case when I see the team play at Dodger Stadium. It might seem silly to take so much comfort in that fact, but after having to cheer on the Reds from behind enemy lines for two decades, it’s incredibly reassuring to know that 2,000 miles east lies a spot where I’ll always have plenty of backup. Our seats were in the second row of the left field bleachers, as I wanted my 8-year-old son to be close to the field for his first game in Cincinnati and also have a chance Ã¢â‚¬â€œ however slim Ã¢â‚¬â€œ to end up with a souvenir. 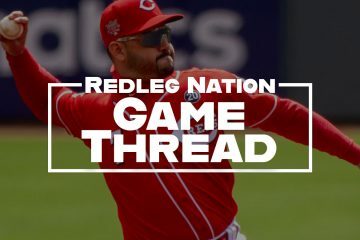 Unfortunately, a day after they pounded 11 hits in a 9-3 victory over the Orioles, the team’s bats fell silent, managing just two hits in a 2-0 loss. Garrett, however, was outstanding, tying a Reds LHP rookie record by striking out 12 in seven impressive innings (and, in the process, earning us the legendary LaRosa’s freebies I’d read so much about). And even though we didn’t catch a home run ball, Adam Duvall lobbed a warm-up ball toward my son near the end of the game, only to have it comically intercepted by a quick-gloved Orioles fan in the row in front of us. (To his credit, after he realized he played Scrooge, he gave my son the ball.) While I wish my son’s first GABP experience would have ended in a Reds win, it was hard to feel upset as we left the stadium Ã¢â‚¬â€œ especially knowing that we’d return in another few days. On our way back to Cincinnati on Sunday morning, we stopped at LaRosa’s in Covington to cash in our pizza freebies and then walked across the Roebling Bridge toward the ballpark, arriving just after the National Anthem ended. Although our seats were in the nosebleeds, I decided to take my own advice and snagged some open field-level seats along the first base line, where we settled in to watch Bronson Arroyo Ã¢â‚¬â€œ whose first name my wife and I liked enough to bestow on our son Ã¢â‚¬â€œ continue his improbable comeback. During the drive north, I had a fleeting Ã¢â‚¬Å“wouldn’t it be great if?Ã¢â‚¬Â thought about Arroyo throwing a no-hitter, and when he mowed down the first 10 Cubs batters in order, I considered buying an Ohio Lottery ticket on my way out of town. Unfortunately, the fourth inning saw a one-out Chicago single followed by a two-run homer, but the fantasy was fun while it lasted. From there, however, Arroyo was impeccable, yielding just one additional single while striking out six. Meanwhile, the Reds offense was humming, thanks in part to some #LOLCubs defense that contributed to a four-run Cincinnati sixth. Mercifully, those cries were quieted two pitches later via a rally-killing double play. Another two pitches later, the game was over. Reds 7, Cubs 5. It wasn’t exactly pretty, but I was thrilled to finally witness a Cincinnati victory at GABP. More importantly, I was glad my son had the chance to watch his namesake score the win. I realize most of you reading this rival or exceed my Reds fandom and don’t need any arm-twisting to attend a game yourselves, but against the Orioles, the announced attendance was just 15,083, and that felt generous. Meanwhile, the game against the Cubs featured just as many fans wearing blue, and although I begrudgingly admired Chicago supporters for not leaving early when it appeared all hope was lost, it was difficult to explain to my son why their 9th inning cheers weren’t being drowned out by fans of the home team, especially after telling him for years that we need to root quietly at Dodger Stadium. That said, while I might not know when my next trip to GABP will take place, I hope yours will come soon, and that you’ll bring a friend or 10 to fill in at least some of the empty seats. Take it from me Ã¢â‚¬â€œ seeing red can be a wonderful experience. Regularly Scheduled Rain Delay: Who won April? Great stuff Clay (and Bronson). I feel all of this with you, as a lifetime Reds fan now in Atlanta and having never lived near Cincinnati. We make an annual weekend pilgrimage, and have been blessed with some wonderful days and games. Last year we were at the game where Michael Lorenzen came back from his bereavement and honored his father with his first home run. The year before we saw the mediocre Reds sweep the Dodgers and enjoyed the pregame festivities with the great eight from the Big Red Machine. And while it’s probably no big deal for the local Reds fans, we do love the Friday Night Fireworks. They do a wonderful job and it feels like our annual welcome to the Reds weekend. I’d like to think we appreciate GABP more because of the effort it takes to get there and root for our team. Thanks for the comment. Glad to hear that you got to witness the Lorenzen homer. And even though I’m obviously biased, I tend to agree that having to make more of an effort to “go the distance” makes one appreciate the destination a bit more. 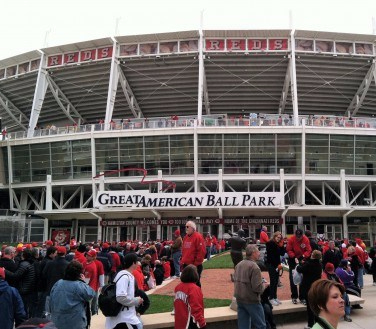 As much as I’d love to live near GABP and have season tickets, I don’t know if I’d end up taking things for granted. Hopefully I’ll be able to test that theory one of these years! It’s always a chore to navigate the traffic to Dodger Stadium, and I only live about 30 miles away. I love seeing the Reds in SD, but the series is almost always right after the L.A. series, and it’s often hard to justify taking more time off of work/school/whatever to head south. Schedule permitting, I’m hoping to catch the getaway game this year, though. Thanks for reading! As a reds fans that just moved to the west coast a year ago I can relate. Going to see the first game in enemy territory in 2 weekends. I have to cheer quietly in the land of Giants…. I have fond memories of my one and only trip to AT&T Park during the 2012 postseason. Enjoy! Most of the Giants fans I’ve ran into seem like decent folks so far plus I’ve heard the park is gorgeous. I’m looking forward to it even outside of the fact that I get to see the redlegs! Good stuff Clay. I’m glad that O’s fan did the right thing and gave your son the ball. The O’s were the team that showed the most interest in me and for that they are my AL team and 2nd to my Reds in my heart. My first Reds game of the season was the O’s game you were at. Garrett was excellent and it was good to take in my first Reds game of the season with my dad. I’m glad you made it out but am sorry there wasn’t more red in the stands aside from the red empty seats. Thanks for reading/commenting. Duvall’s throw to my son felt like it happened in slow motion, where at first, I was worried if he’d catch the ball, and then out of nowhere came the slapstick interception. All’s well that ends well, though. Glad you got to see the game too, even though I wish it had a happier ending! Lifelong fans from NJ. It was very hard until MLB extra innings pass came along 10 years ago. I have so many great stories of following the Reds. Parents digital radio, aluminum foil, a window, on a Sunday around 1980 & was introduced to WLW 700 and Martty & Joe! Ninth inning comes Reds down 1, Joe says we need a bloop & a blast. Forgot who got the bloop, but Tony Perez hit the blast! The ONLY TIME I EVER got the station to come in! We made it to Cincinnati in 2008. Now friends with Chris Welsh, I can’t get out there due to family health, but am going Memorial day weekend to Philadelphia to see him & the Reds. Enjoy your trip to Philly! Great story clay; got a little misty eyed. Is there anything more special than a father taking his son to his first professional game. Mine was at Crosley Field. I’d better stop, the letters are getting hard to see. My dad took me to one reds game at crosley field. I don’t remember much about the game (except the reds lost). We sat just a few rows back down the right field line right beside the bullpen. One trip to Crosley field with my Dad in my lifetime and he made a one hand grab of a pretty hot foul ball. I’m 63 and still (of course) have the ball. I hesitate to hand the ball down to my son. He wouldn’t appreciate it enough. That’s a great story, and who knows, maybe the ball will someday remind your son of you the same way it reminds you of your father. Better yet, snag a foul ball the next time you see a game with him!